Home / Contests • Featured / Contest Time! 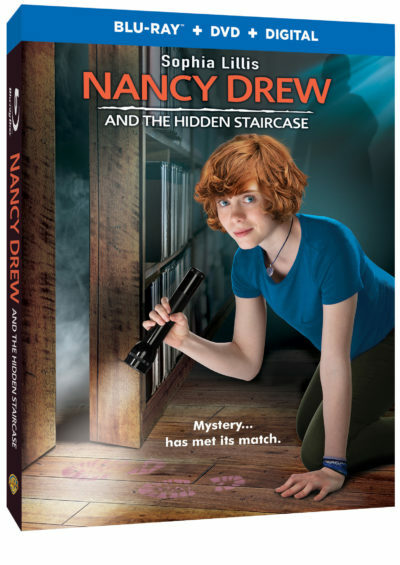 Win Nancy Drew and the Hidden Staircase on Blu-ray! The Sleuthing Detective Heads Home April 2! Nancy Drew And The Hidden Staircase is heading home on Digital March 26, 2019 and on Blu-ray™ Combo Pack & DVD on April 2, 2019. It’s an adorable film that the whole family will love. Sophia Lillis is great in the title role and it’s a perfect film that will really appeal to fans of the original series and books. If you want to check the film out for yourself, you are in luck because thanks to the film peeps at Warner Media we have a copy to giveaway on Blu-ray! Check out the newest Nancy Drew and the Hidden Staircase blog app. American Dream Builders Lowes Gift Card Giveaway! Watch The Premiere March 23 On NBC! Book Beat! The Midnight Star Blog Tour! Favorite villains & anti-heroes in pop culture! Win Dragons: Defenders Of Berk Part 2 On DVD! Own It On May 27th! It’s The Year Of The Dragon!! I am excited to share this movie with my aunt as she loves Nancy Drew and does not know about this movie. I’ve always been a Nancy Drew fan, and I’m excited for the opportunity to share Nancy with my granddaughter. Watching it with my nieces! I am excited to share it with my grandson and granddaughter. I told my grandson that I use to read the Nancy Drew Mystery book when I was his age. He is excited to see it with me. I haven’t seen it so I’m super excited just to have the chance to!